When I visited China in the spring of last year, one of my most vibrant memories was of the old town west of Kaiping City named Chikan (赤坎) (Google Maps). 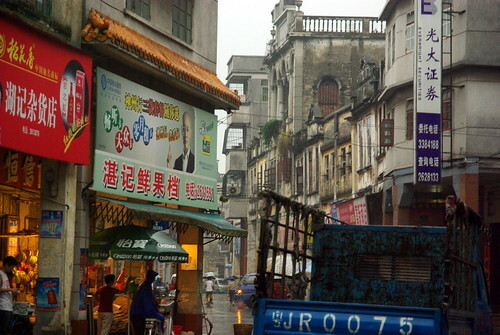 Yes, the Kaiping region is well-known for its diaolou, like Zili village, but the Chikan township, under a typical southern China with a thick summer rain pouring on us while we visited, was perhaps less spectacular, but a lot more “familiar”. Chikan looks like a movie set — and I think there is a film studio built on the outskirts of the historical town. Buildings are darkened with mold, but the businesses look nonetheless thriving. My friend Tiffany, whose ancestral town is Kaiping, and I were the only “tourists” in that town on that particular day it seemed. 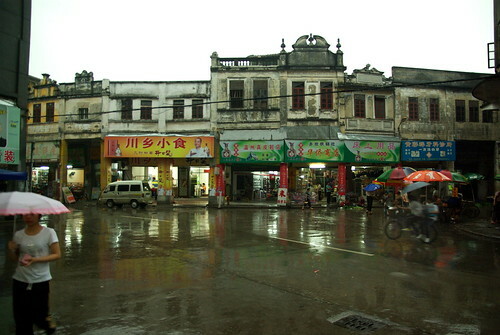 Kaiping may be a UNESCO site, but Chikan seemed particularly thin in terms of out-of-towners when we visited. There was a wet market, where the word “wet” took all its sense. Vendors were literally selling their foodstuffs on the ground, over old pieces of styrofoam/cardboard. The fresh produce looked amazingly fresh. There was also a “meat counter” that was exactly that: a table with pieces of meat that the butcher could chop for you. Shops on the main street of Chikan (you can walk the whole town in 30 minutes) were pretty diverse, and included shoe shops, cellular phone dealers, rice vendors and coffin makers. There was one convenience shop — kind-of the Wal-Mart of Chikan. 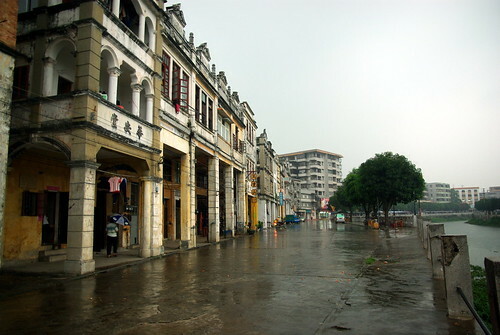 It looks like Old Shanghai in that movie set that they used for Lust, Caution, and reused for a bunch of movies (like that razzie with Rene Liu, Fan Bingbing and Leon Lai), but also a bit like the Melaka old town (perhaps because it was built by Chinese? Or endured the same colonial influence?). It definitely makes me think that one of my ancestors could have lived in this type of house (but no, they were actually peasants). From Hong Kong’s West Kowloon Ferry, Kaiping is extremely accessible, on speed foil, with a few hundred RMB and a valid passport. 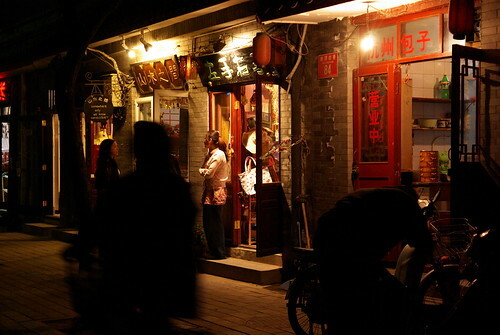 You can stay at the Ever Joint Hotel, a five-star hotel, for something like 300 RMB a night. We left the city by bus to Shenzhen, at the bus terminal, just on the island north of the hotel, across the river. For transportation, we hired a taxi that took us to Zili Village, and then Chikan. But taking the city bus back to Kaiping City (a 20-minute ride) is definitely the economical and adventurous way of doing things. I absolutely recommend that. It’s even more adventurous if you go around without a map on you. Au mois de mai, à ma dernière journée à Hong Kong, j’ai rencontré Ashley Wong pour ce prochain Regarde les Chinois. Torontoise de naissance, autrefois Montréalaise, et à ce point-ci Hongkongaise, elle a travaillé pour une organization artistique en nouveaux médias appelée Videotage jusqu’au début de cet été, et je venais de participer à Folktales From Many Lands, un de leurs projets à ce moment. Nous avons parlé le défi de trouver de l’espace et son propre espace à Hong Kong. Back in May, on my last day in Hong Kong, I met with Ashley Wong for this next Regarde les Chinois. 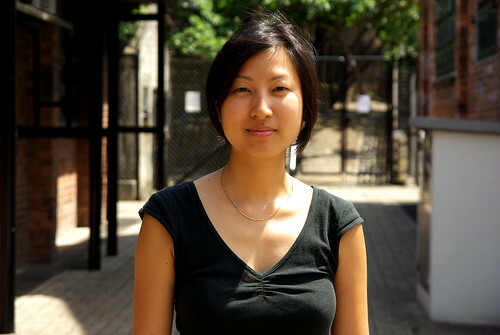 A Torontonian by birth, she was once a Montrealer and at that point a Hongkonger, she worked at a new media art organization called Videotage, and I had just participated in Folktales From Many Lands, one of their projects at the time. We talked about the challenges of finding space and one’s space in Hong Kong. Dans ce prochain Regarde les Chinois, j’ai fait la rencontre en mai dernier de Paul Zimmerman, un Hongkongais d’origine néérlandaise depuis 1984. M. Zimmerman fait partie de l’organisation à but non lucratif Designing Hong Kong qui fût à l’avant-garde d’un débat sur l’espace ouvert public qui fit rage depuis le printemps dernier. Directeur-général de Jebsen Travel, il se présente comme candidat du Parti Civique pour le siège de représentant au tourisme du conseil législatif de Hong Kong lors des élections du 7 septembre. Dans l’entrevue, M. Zimmerman a beaucoup parlé de politique en développement urbain à Hong Kong, un sujet qui le passionne depuis son implication avec divers groupes, et de l’univers particulier de la Région administrative spéciale. 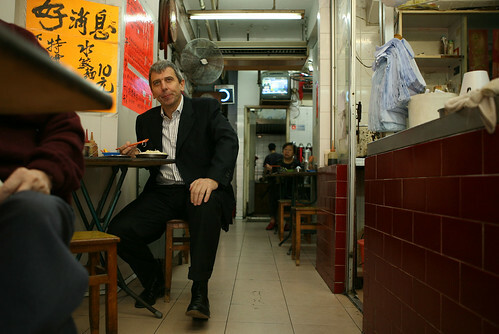 In this next Regarde les Chinois, I met (in May 2008) with Paul Zimmerman, a Hongkonger who came from the Netherlands in 1984. Mr. Zimmerman is part of Designing Hong Kong, which was at the avant-garde of the debate on open space that raced through Hong Kong since last spring. Executive director of Jebsen Travel, he is running as the Civic Party candidate in the tourism functional constituency of Hong Kong’s LegCo (legislative council) on the September 7th election. In this interview, we talked a lot about the politics of urban development, a topic that he is passionate about since his involvement with various groups, and the unique universe of the Special Administrative Region. Ceci est une traduction d’un texte que j’ai écrit pour le blogue de Bande à part, publié le 8 août 2008. Last April, I was in East Asia to attend a rock music festival in Kenting, Taiwan, and then made a stop in Hong Kong, where I discovered small record stores. During the same trip, I also spent two weeks in Beijing. My musical adventures started off quite ironically, as my hosts, an American-Chinese and a Briton, took me to see a concert fronted by You Say Party! We Say Die!, a party punk band from Vancouver, that happened to be touring China at the time! The venue was called the D-22 and is located in the area close to Beijing University, where its founder, a Newyorker, also teaches finance. We were probably a crowd of a hundred-something people, half of which were foreigners, and the other half, presumably locals, on that Friday night, to fill the D-22, a bar just slightly larger than a closet (at most 10m of width). YSPWSD, who played on the previous evening at the Mao Live, a venue located at the heart of Beijing, told me their amazement in front of this overcrowded, ever-changing megalopolis, and the fun they had performing in it. “Crowds are very receptive here! We didn’t have to prompt them to mosh: they took care of it for us!”, said Stephen O’Shea of YSP!WSD! before the show. The opening show only started after 10:30PM, and the main act only came to stage after midnight. The local bands opening for YSP!WSD! were Candy Monster, Guai Li (see top photo), and Ourselves Beside Me (sic). Judging from the exodus of Chinese spectators from the front of the stage, after Ourselves Beside Me’s performance, we quickly took note that they were probably more well-known to locals. After some research, I realized that one of its members, bassist Yangfan (see photo), was once a member of Hang On The Box, an all-girl punk band, and one of the most well-known to ever come out of China. Separated since their last album, in Fall 2007, which Yangfan already wasn’t part of, HotB was one of the bands followed in the documentary Beijing Bubbles. 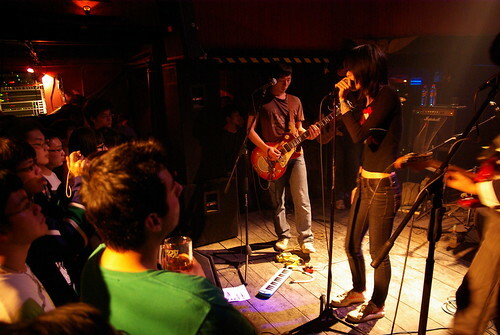 The German production also introduced us to other well-known bands of Beijing founded between 1996 and 2001, such as Joyside, New Pants, Sha Zi and T9. 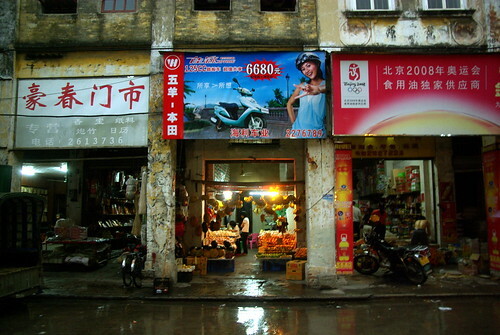 Poster of Beijinger Zuoxiao Zuzhou / 左小祖咒‘s 2001 album (左小祖咒在地安门), Overseas version. Seen at the Sugar Jar, for 100RMB. The scene’s history cannot be told without mentioning Cui Jian, the one dubbed the godfather of Beijing rock. Cui, whose songs were once chanted by the students of Tian’anmen Square in 1989, fled to the mountains of Yunnan, in the country’s Southwest, slightly after the events of June 4th, like many other rockers at the time. Since then, he has been rehabilitated, and now gives concerts in sold-out stadiums around the world, like in San Jose, California, in early May. Tang Dynasty and Black Panther are other well-known names from this period of the 1990s. Other bands in the meanwhile, like Brain Failure, regularly toured Europe and the USA. Local bands touring around the world: not too rare (when will they decide to make a stop in Montreal?). Lee Clow, an American expatriate, who lived in Beijing for 8 years, explains that the rule is that if they are popular in the West, generally, they would be in only one country! 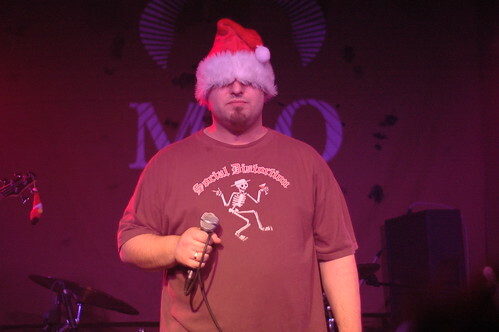 “Joyside, it’s in Germany, and Brain Failure, good for them, it’s in the US!” Clow has himself been part of a band called End of the World, practically the only ska band in Beijing, because of longevity. In the last days of my stay in Beijing, we talked about the most important music festival in the country, the Midi Music Festival, named after Beijing’s contemporary music school being reported. 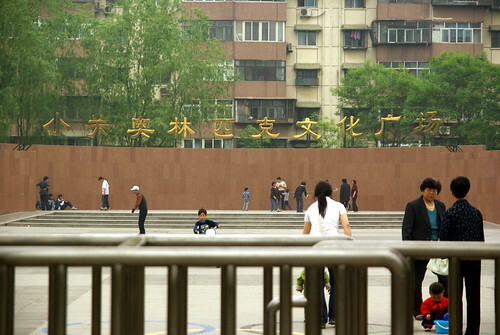 Usually held around the May 1st public holiday since 1997, in Haidian park, in the universities district, “Midi” gets between 40,000 and 80,000 spectators each year. But this year, as it was the case in 2003 (because of SARS) and in 2004, police asked the organizers to delay their event until the October 1st national day. 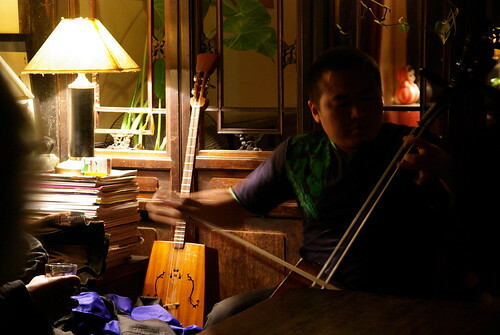 Rockland 摇篮 music store and its owner, Xiao Zhan, in Houhai since 2004. Before leaving Beijing, I went wild at local music shops. More accessible from the city’s centre, there’s the Rockland, established in 2004 in Houhai, a lake around which were built bars and restaurants for tourists and young rich people. I bought a number of safe bets, like Joyside’s latest, and also the current new hot property Carsick Cars‘ (they were in Time Magazine’s July 17th, 2008 edition) only album. Both were published by the Maybe Mars label. I also picked up an electro compilation, and an album from a folk rock signer named Wan Xiaoli of independant Modern Sky. 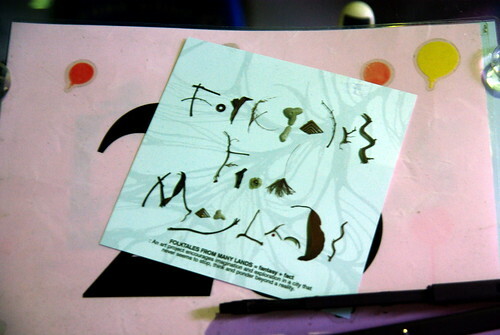 You might also this type of good self-made albums circulating at 100 copies. 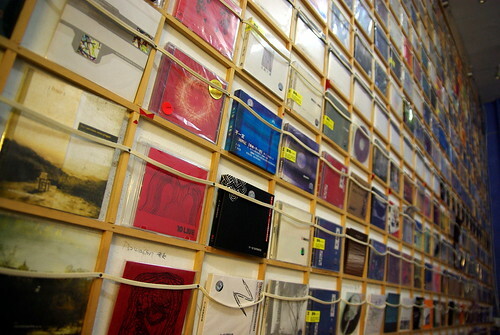 One of the best-known independent record stores in town is the Sugar Jar, located in the 798 art zone, old military warehouses recycled as an art and design zone. Jewel case wall at the Sugar Jar. Aside from selling CDs, tiny Sugar Jar may also be fitted as a performance room. That’s where Joshua Frank, a McGill student who spends the rest of his year in Beijing, and the experimental rock band Hot & Cold that he completes with his brother, occasionally plays. His brother also happens to be in a band with Carsick Cars’ Shouwang, frequently lauded as China’s new guitar icon. 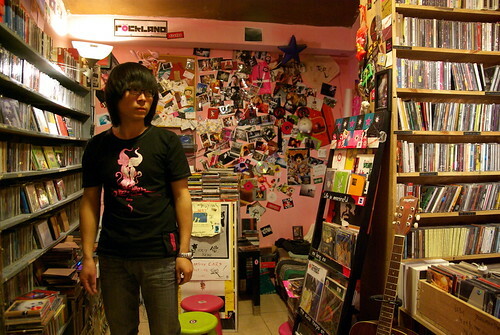 On the electronic music scene, the name that circulated in conversations and promotional posters was Sulumi (real name Sun Dawei), a chiptune musician. Shanshui, the label that he started, just organized an Asian tour with other Chinese and Japanese artists. Among recommendations in this genre, there was an interesting electronic mix of Yi ethnic minority music. Pleasant to the ear / Lies! After throwing all these names at you, what can you do to discover more Chinese indie music? The first thing to do is to look at a Chinese site called Neocha (in English: New-Tea), or listen to its Next web radio. 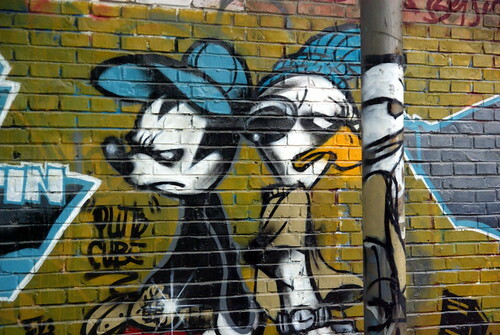 Random graffiti at 798 – the only place in Beijing you will see graffitis! An English version of this article was published on Spacing Montreal and Spacing Toronto. 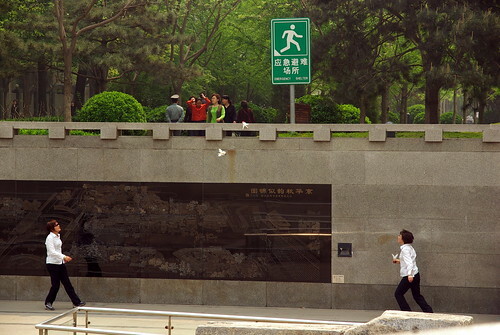 Nanluogu Xiang est situé sur l’axe central de Beijing. 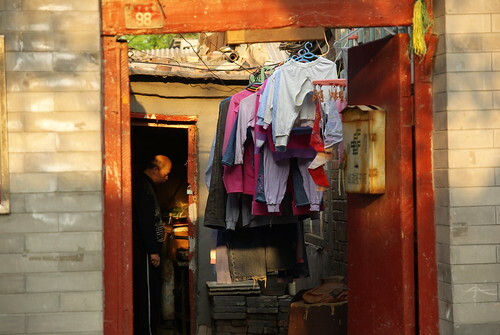 Faisant l’objet d’un article sur le site officiel des Jeux Olympiques de Beijing, ce hutong est parmi les plus célèbres de la ville et s’est vu attribuer un statut spécial depuis 2006. Ça n’a été qu’à la fin de ma deuxième semaine à Beijing que j’aie finalement pu m’y promener, et ce, un peu par accident. Après mon repas de jiaozi (dumplings/raviolis chinois), l’ami né en Ontario, d’origine chinoise avec qui j’étais allait me faire faire le tour du quartier où il vivait, qui se trouvait juste un peu plus loin après le Nanluogu Xiang! Étudiant en médecine chinoise, il a commencé à louer une chambre (c’est un 3 1/2, en termes montréalais) dans une maison traditionnelle pourvue d’une cour, non loin de là, pour à peu près l’équivalent de 275 de nos huards. 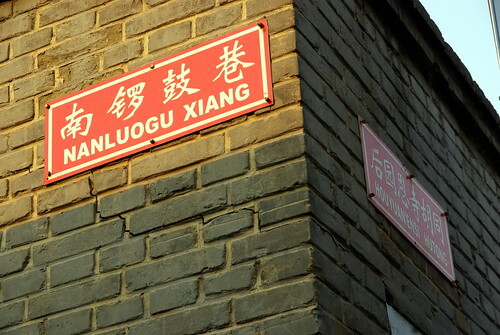 Quand il a initialement déménagé dans le quartier, il se rappelle que Nanluogu Xiang ne ressemblait en rien à ce que c’est aujourd’hui (comme me le confirme d’autres amis qui ont vécu à Beijing à l’époque). 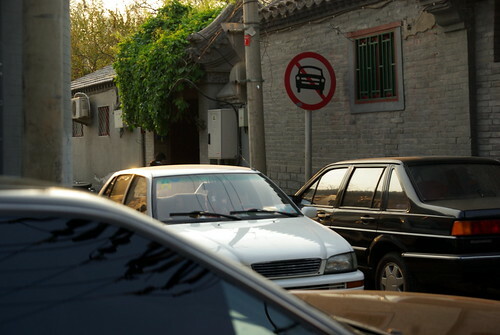 Sur la ruelle qui s’étend sur un kilomètre entre Gulou Dajie (avenue de Gulou) et la rue Di’anmen, où donne aussi la face ouest de l’École d’art dramatique centrale, (où Zhang Ziyi et d’autres noms du cinéma chinois ont étudié), il n’y avait en fait que deux cafés. 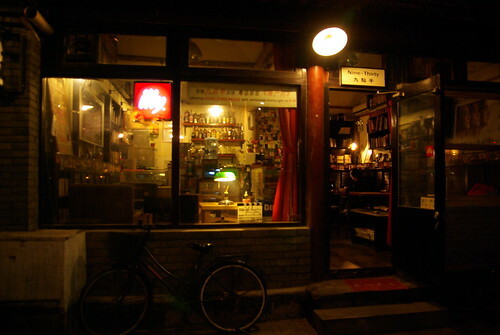 En 2008, on y trouve maintenant toutes sortes de commerces, comme le Nine-Thirty, un café Hongkongais avec wifi et projection quotidienne de film, ou un bar-salon de thé avec des spectacles de musique (voir photo ci-bas), comme le Sandglass Café, appartenant à ses deux amis dans la fin vingtaine d’origine ethnique mongolienne, ou encore, un magasin de t-shirts concept comme Plastered qui joue sur des points de repère de Beijing (j’en ai acheté un avec un ancien billet de métro dessus). La chance a frappé à nouveau, le lendemain, quand je suis retourné à Nanluogu Xiang en suivant ma propre route. Alors que je marchais d’un bout à l’autre du hutong, des t-shirts au design particulier suspendus à la vitrine d’un des magasins ont attiré mon attention. 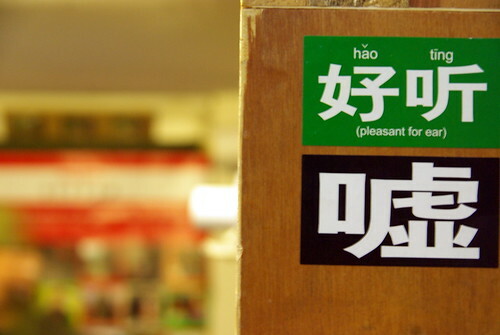 Après le mot de bienvenue standard débutant par « Ni hao », le propriétaire du magasin change à l’anglais pour me dire qu’il était en fait né à Montréal! Avec ses deux amis chinois d’outre-mer, Raymond Walintukan (lisez l’entrevue réalisée avec eux) a fondé NLGX (l’acronyme de Nanluogu Xiang), un café/magasin de design et de style de vie. Parlant de leur terrasse sur le toit qui surplombe Nanluogu Xiang, il m’explique que la zone entière a été reconstruite et est protégée par le gouvernement municipal, et que le quartier ne changera pas pour des décennies à venir. Parmi les boutiques branchées, des gens vivent encore dans des maisons traditionnelles d’une ou deux étages. Lors de ma troisième visite, j’ai pris une photo, sans me gêner, d’un homme qui était en train de se faire à souper. Il faut dire, quand même, que sa porte donnait directement sur la ruelle! On April 13th, when I was in Hong Kong, I had the chance to participate in Folktales from Many Lands, a story-telling experience spanning four different sites on the SAR’s territory. Two minibuses picked up participants at the Hung Hom railway station in TST and took them between the old HK airport (Kai Tak), Lok Fu park in Wong Tai Sin, Mount Davis on Hong Kong Island, and finally, the South Bay Beach on Hong Kong Island South. This weekend, July 26-27, was held the event’s exhibition at KLUUBB, a tiny art space in Wan Chai where FfML is also headquartered. During the tour, the organizers handed out disposable cameras, and asked participants to photograph whatever they wanted along the tour of Hong Kong (in a sense, reappropriating it), record and tell their stories as discoveries are made. 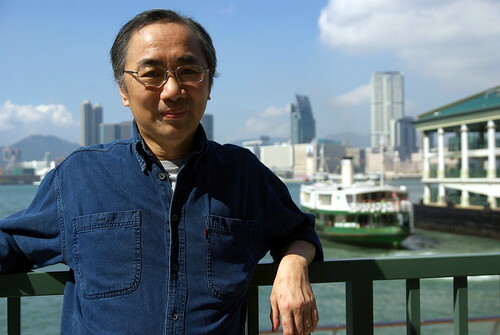 The Regarde les Chinois series made a stop in Hong Kong in early May to meet Roland Soong. 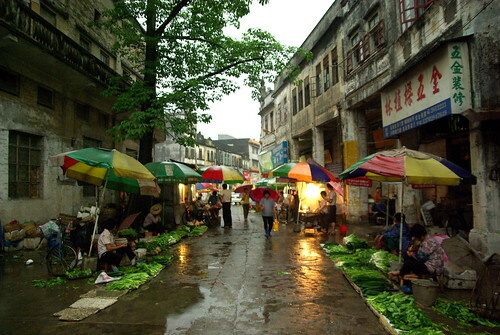 Shanghainese by birth, but a resident of New York for thirty years (until his return to Hong Kong in 2003), he is the blogger behind EastSouthWestNorth (ZonaEuropa.com), a site that welcomes tens of thousands of visitors on a daily basis, and which you have probably read if you are interested in China. Every day, aside from his regular job as CTO for the world’s second-largest media research company, Soong translates articles from Chinese-speaking newspapers and blogosphere for the benefit of English-only readers. 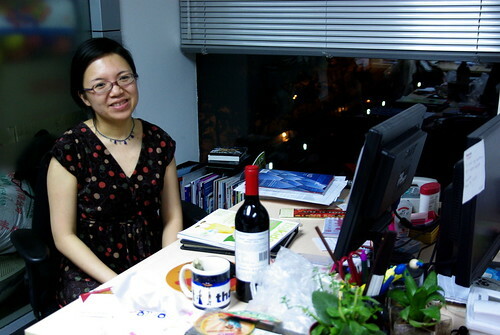 We obviously spoke about media, but also of Lust, Caution, whose author of the short story it was inspired by, Eileen Chang, was a personal friend of his parents, and of other topics, like prostitution in Hong Kong, the coverage of the then-recent Tibet riots, the origins of ESWN and foot racing. This interview was conducted on the Thursday before the Sichuan Earthquake, which is why we didn’t talk about it (it made the site fall, but it still wasn’t the year’s most popular item, as explained later by Mr. Soong). La série Regarde les Chinois s’est arrêtée à Hong Kong pour rencontrer Roland Soong au début du mois de mai dernier. Shanghainais de naissance, mais résident de New-York pendant 30 ans (jusqu’à son retour à Hong Kong en 2003), il est le blogueur derrière EastSouthWestNorth (ZonaEuropa.com), un site qui accueille des dizaines de milliers de visiteurs par jour et que vous avez sans doute déjà visité si la Chine vous intéresse. En marge de son travail habituel comme directeur technique de la deuxième plus grande compagnie en étude des médias au monde, Soong traduit quotidiennement des extraits choisis de journaux et de la blogosphère sinophone. Nous avons bien sûr parlé de médias, mais également de Désir, danger, dont Eileen Chang, l’auteure de la nouvelle sur laquelle s’est basé le film, était une amie personnelle des parents de Soong, et de d’autres sujets, comme la prostitution à Hong Kong, de la couverture des émeutes d’alors au Tibet, des origines de ESWN et de la course à pied. Nous nous sommes rencontrés au Pacific Coffee du IFC – je n’ai même pas eu le temps de partir mon enregistreuse que l’entrevue démarrait. Cette entrevue a été réalisée le jeudi précédant le séisme du Sichuan, ce qui explique pourquoi on n’en a pas parlé (qui fit tomber le site, mais qui n’est pourtant pas l’item le plus populaire de l’année, comme M. Soong l’expliquera). Un article que j’ai composé pour Spacing Montréal a été repris par Spacing Toronto hier, notre publication-mère. Vu l’intérêt suscité, le voici traduit en français. Megan Hall, la correspondante de Spacing Toronto à Beijing cet été vient récemment de signer un article très intéressant sur l’équipement d’activité physique publique dans les parcs et terrains de jeux de Beijing. En avril dernier, je suis resté deux semaines à Beijing, et ai pu moi-même découvrir comment les Pékinois investissaient leurs espaces publiques pour se garder en forme. L’article de Megan m’a d’ailleurs inspiré à parcourir ma collection de photos. Par exemple, une activité populaire, qui peut être pratiquée simplement sur le coin d’une rue ou un square publique possédant une surface plate assez grande, est de botter des volants (comme on joue au aki ici). Les gens que j’ai croisé dans les diverses instances en train de jouer ressemblaient à des employés de bureau ou de magasin prenant une pause. 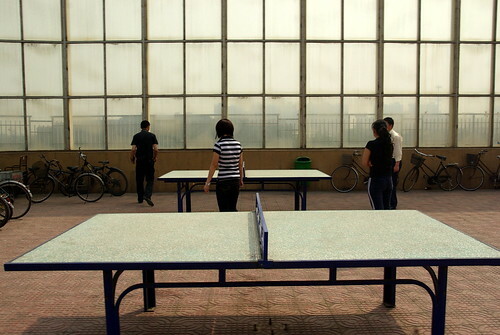 Vu que le ping-pong est un sport si populaire en Chine, ce n’est peut-être pas surprenant de retrouver des tables pour jouer à l’extérieur, comme sur cette photo prise dans un espace publique près d’un complexe résidentiel. 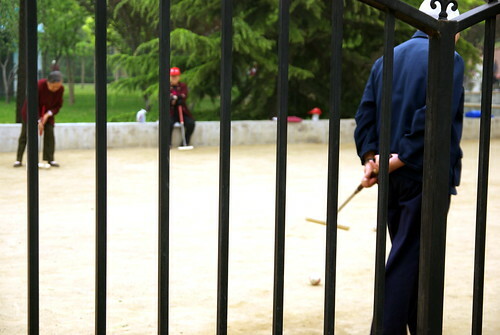 Dans cet autre parc, à juste quelques centaines de mètres du site olympique principal, quelques personnes du troisième âge jouent au croquet entre eux. Le terrain de jeu en question a l’air d’avoir été rénové récemment. Regarde les Chinois : Fiona L.
Regarde les Chinois complète sa tournée de Beijing avec cette sixième et dernière entrevue. Née à Hong Kong, grandie en Californie méridionale, et définitivement une New-Yorkaise dans son coeur, Fiona réside aujourd’hui à Beijing, où elle travaille et maintient Quirky Beijing dans ses temps libres. C’était mon dernier soir à Beijing, après deux semaines passées dans la ville, et Fiona a bien voulu répondre à mes questions, malgré le rhume récent qui l’a tût pour les deux derniers jours. Nous avons parlé de ses jours comme enseignante d’anglais langue seconde entre 2006-07, de ce qu’elle pense de la vie d’expatrié en Chine, et de Beijing et de son côté inusité. Regarde les Chinois completes its tour of Beijing with this sixth and last interview. Born in Hong Kong, grown up in Southern California, and definitely a New Yorker at heart, Fiona now lives in Beijing, where she works and runs Quirky Beijing on her free time. It was my last night in Beijing, after two weeks spent in the city, and Fiona answered my questions despite nursing a recent cold that totally silenced her for the past two days. 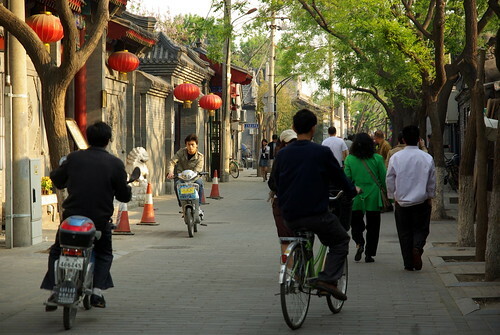 We talked about her days as an English second-language teacher in 2006-07, what she thinks about expat life in China, and Beijing and its quirkier side. Categories En Chine 2008 / In China 2008, English, Regarde les Chinois1 Comment on Regarde les Chinois : Fiona L.
Photo by Max-Leonhard von Schaper. Je vous présente cette fois un Regarde les Chinois un peu spécial. L’entrevue devait à l’origine servir pour un article sur la scène musicale locale dans la capitale chinoise, mais n’ayant pas pu écrire ledit article, je vous la présente comme entrevue sur ce blogue. Lee Clow est un Washingtonien d’origine (comme l’état) et résident de Beijing depuis les huits dernières années. Nous étions en train de chiller sur la terrasse sur le toit du NLGX, et avons alors parlé de son band ska, de ses bonnes rencontres avec des personnages de la musique pékinoise, et de ce qu’il entrevoit pour le futur de la scène. This time, I present you with a rather special Regarde les Chinois. The interview was meant to serve as an article on the local musical scene in the Chinese capital, but since it was never written, I am presenting it as an interview on this blog. Lee Clow is a Washingtonian of origin (as in the state) and a resident of Beijing for the past eight years. We were chilling on the NLGX rooftop patio and spoke about his ska band, his interesting encounters with Beijing music characters, and what he sees in the scene’s future.